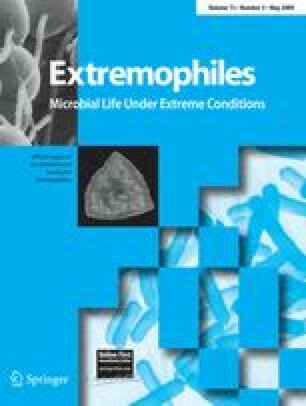 We examined short- and long-term desiccation tolerance of 31 strains of thermophilic and hyperthermophilic Archaea and thermophilic phylogenetically deep-branching Bacteria. Seventeen organisms showed a significant high ability to withstand desiccation. The desiccation tolerance turned out to be species-specific and was influenced by several parameters such as storage temperature, pH, substrate or presence of oxygen. All organisms showed a higher survival rate at low storage temperatures (−20°C or below) than at room temperature. Anaerobic and microaerophilic strains are influenced negatively in their survival by the presence of oxygen during desiccation and storage. The desiccation tolerance of Sulfolobales strains is co-influenced by the pH and the substrate of the pre-culture. The distribution of desiccation tolerance in the phylogenetic tree of life is not domain specific. Surprisingly, there are dramatic differences in desiccation tolerance among organisms from the same order and even from closely related strains of the same genus. Our results show that tolerance of vegetative cells to desiccation is a common phenomenon of thermophilic and hyperthermophilic microorganisms although they originated from quite different non-arid habitats like boiling acidic springs or black smoker chimneys. We want to thank Kerstin Roth for performing desiccation experiments with Metallosphaera sedula and Dr. Guenther Reitz, Head of Radiation Biology Department at German Aerospace Center (DLR), for ongoing support.